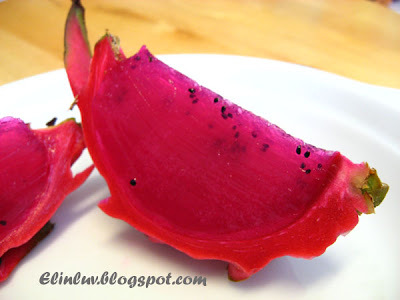 :) I just found out that red dragon fruits …..
- also contain significant quantities of phytoalbumin antioxidants, which prevent the formation of cancer-causing free radicals. - in Taiwan, diabetics use the fruit as a food substitute for rice and as a source of dietary fibre. - supposedly increases excretion of heavy metal toxins and lowers cholesterol and blood pressure. - eaten regularly, it is credited with alleviating chronic respiratory tract. Whoa…good for you and for me…don’t you think so…. I found this refreshing jelly recipe from Amy Ong of Cooking Crave…. Thanks Amy , for sharing this fruit jelly with us. Simple and easy way to make kids eat the fruit this way. these look good for my photoshoot session...LOL! Wash & soak the jelly strips for 10 mins or more. Bring water to boil. Add jelly strips, knotted pandan leaves and cook till it is fully dissolved. Add in sugar and cook till it is completely dissolved, turn off heat.Discharged pandan leaves. Stir in blended dragon fruit puree into the jelly mixture. Pour the mixture onto the jelly mould or 2 inch tray. Allow to cool down before chill it in the fridge. 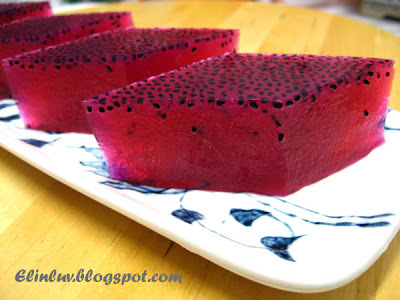 Note from Amy Ong: *If you prefer to have bites of the dragon fruit in jelly. 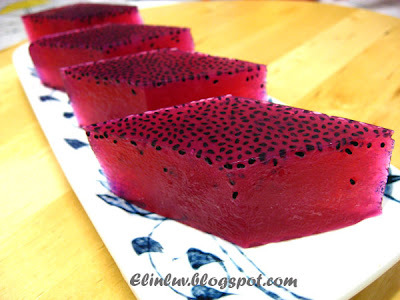 Don't blend the dragon fruit instead cut them in 1cm cubes and drop it in the cooked jelly. 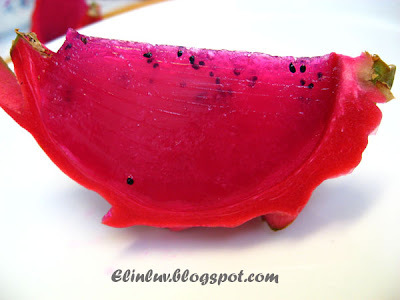 Reduce the sugar if the dragon fruit are sweet and vice versa. This jelly makes a good after dinner dessert.